In 1997 I was staying a a place that had cable TV with a Country Music Video channel. I used to watch in the off chance that a really good song would come on that I hadn't learned. To tell the truth, I had about given up on new music by then and in the span of the next decade dozens of really great country songs where released by various new artists. I was back, hooked on music once again. 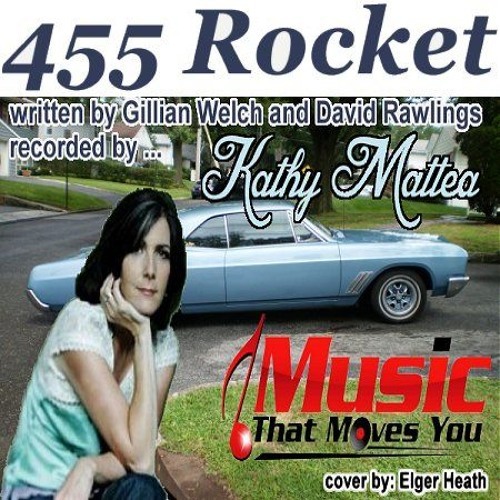 One of those songs to grab my attention was a tune, written by Gillian Welch and David Rawlings, called 455 Rocket. Recorded by Kathy Mattea, this song had a quick, Bluesy sound with a wild harmonica that snapped me to attention. I learned it by heart and it sticks in my mind even today. If you are going to perform for an audience, it pays to have a variety of kinds of music in your repertoire. Fast songs, slow songs, blues, gospel, rock, folk and country. Happy songs, sad songs, frivolous and serious music. Something to make people laugh, or cry, to think deeply or just move with the music. This fulfills many of those categories. Add to that the fact that it has some really good lyrics and a solid story behind it and you have a recipe for a great tune. Check out this simple cover out and be sure to look up Kathy's original recording.